First, set out the bare essentials and then add a few items that you want to bring along. Noting everything down helps you keep track of what you really need to pack and what can be left at home. Pack clothes that serve a dual purpose and that can be paired up with multiple items. Tip: Pack by outfit so you don’t waste space by packing clothes that don’t go with anything or that you might only wear once. Don’t be one of those people at the check-in counter moaning about having to buy extra luggage. Find out what the baggage policy is of the airline you’re flying. Some low-cost airlines only offer hand luggage, so you’d need to purchase additional checked luggage if a carry-on bag is not enough. Tip: Save up to 50% by purchasing extra luggage online rather than at the airport. Rolling your clothes takes up less space than folding them. This way, you can also roll up smaller items and stuff them into empty pockets and gaps. 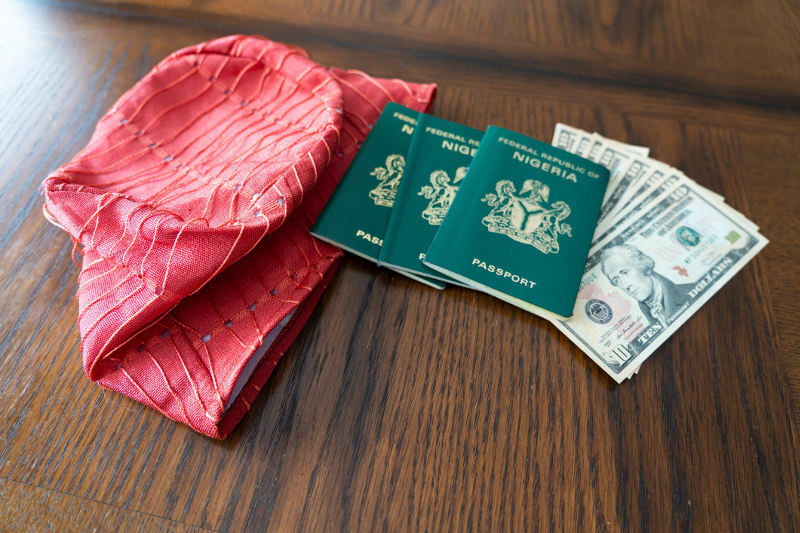 Rather than fumbling about for your ticket or hotel voucher, have all your travel documents together in a pouch or envelope, and store them in a separate compartment for easy access. 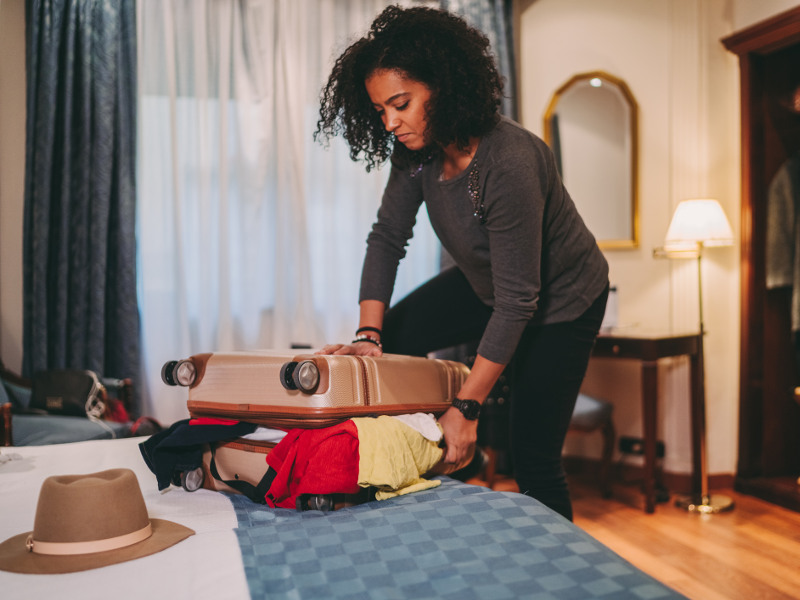 It’s always good to be prepared, so pack in an extra outfit that you can change into to freshen up between long layovers or should your luggage go missing. The last thing you want when you open your bag is to find your clothes covered in shampoo or make-up. Liquids expand and contract with cabin pressure and changes in altitude, so it’s best to seal the top of the lid with plastic wrap and keep your containers in a ziplock bag. 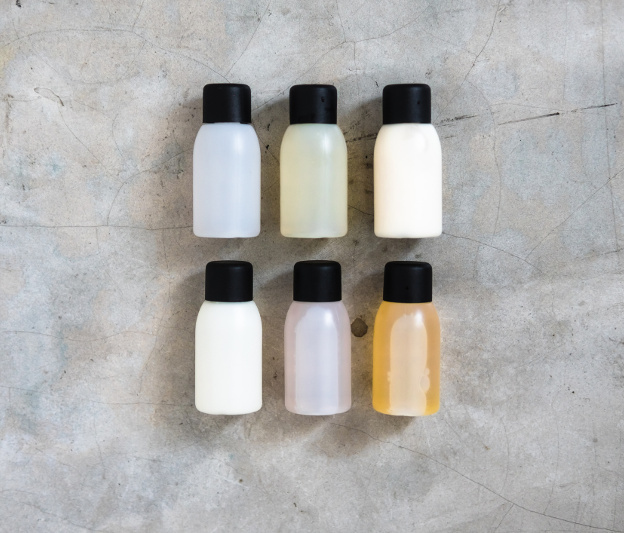 Toiletries can be bulky, so if possible, pack sample sizes or decant your products into small travel-sized bottles. Also, take advantage of your hotel’s complimentary toiletry packs. If you run out of anything, you can always buy as you need. Free up space in your suitcase by wearing your bulkiest outfit. Your favourite bomber jacket or hoodie can double up as a pillow and blanket to keep you comfy and warm inside those chilly cabins. Avoid your clothes getting scuffed and dirty by wrapping your shoes in plastic bags or disposable shower caps. Economise empty spaces in your suitcase by stuffing socks and smaller items into shoes and hats. Fragile items can be wrapped in scarves, socks and beanies. Instead of packing stacks of hoodies, jerseys and jackets, rather pack in thinner items that you can layer up – this also gives you more options to wear! Always protect your gadgets and electronic devices by storing them in a waterproof casing or ziplock bag, especially if you’re hopping onto a boat. Packing smaller items like chargers, headphones, keys and earplugs in a sunglasses case will ensure they don’t get crushed or lost. Leave grandma’s diamond ring at home, and if you must travel with valuable jewellery or other items, place them in empty, nondescript tubes and containers. Also, don’t pack these items anywhere near the top of your bag, but rather hidden between clothes so they’re out of reach of pickpockets. Your plain, black suitcase could easily be mistaken for someone else’s, so make sure it’s easily identifiable. You could tie a colourful ribbon to it, clip on a bright belt strap or embellish your bag with stickers. Need we remind you to always tie on an identity tag? Avoid the hassle of trying to find a foreign pharmacy. Rather have a basic medical kit with essentials like paracetamol, stomach tablets, probiotics, eyedrops, plasters and ointments. Tip: Never pack chronic medication in your checked luggage, always keep it in your carry-on bag with its prescription (if necessary). Layer dryer sheets or fabric softener between your clothes to keep them smelling fresh. You can also place small hotel soaps in between your clothes – plus you’ll have a scented memento of your trip when you get home! Always carry a pack of face wipes in your hand luggage – it might be a while before you reach your hotel room, and a wet-wipe ‘spritz’ will leave you feeling fresh and awake throughout your journey. Whether you’re packing a backpack or a suitcase, always pack the heaviest and bulkiest items at the bottom to maintain balance. Placing lighter items at the top will make it easier to wear as a backpack or to wheel it around. It’s a good idea to always have a pen and notebook handy should you need to jot down an address, phone numbers, fill in forms at the airport, and visa-on-arrival forms in the plane. 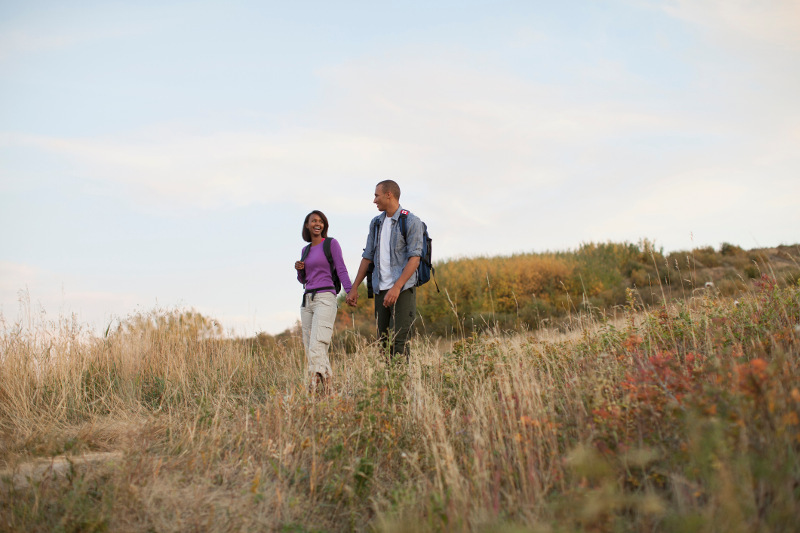 Be realistic about your trip and pack sensibly. Don’t pack in unnecessary things that you’ll probably never use. If you haven’t been to the gym in a while, you won’t suddenly start on your holiday – leave the gym clothes at home. Your trip to Mauritius might not require hiking boots, but you’ll definitely need a swimsuit. Always check the weather and decide what you might be able to buy on the other side. For example, do you really need to pack an umbrella or can you just buy a thin poncho along the road in case it rains? Tip: Planning a packing list ahead of time will help to avoid you panicking at the last minute and grabbing unnecessary items. Valuables and essentials should be kept in your carry-on luggage, not your checked luggage. While your travel insurance may cover stolen or lost luggage, you don’t want to risk losing your prized watch to the airport staff’s sticky fingers. Make sure you bring your passport, ID documents, wallet, electronics, jewellery and other valuables onto the plane with you. 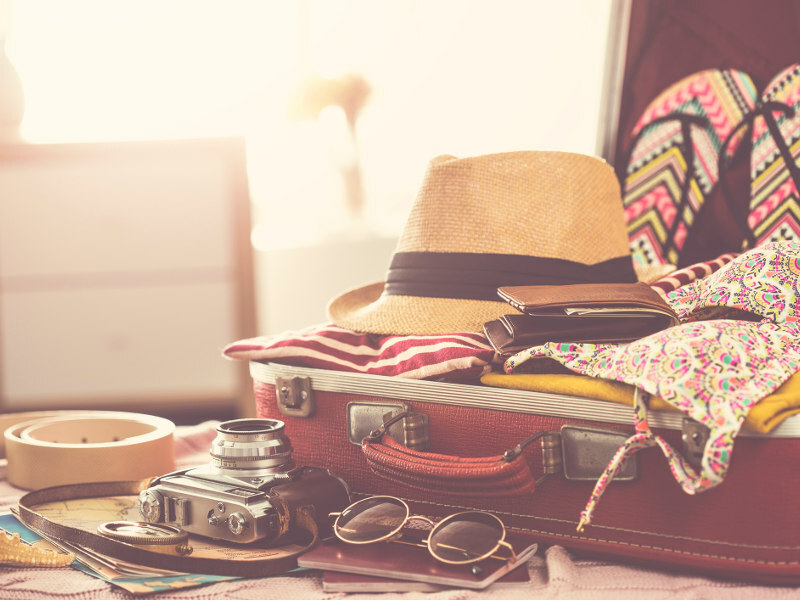 Hopefully now you’ll feel a lot more relaxed about packing luggage for your next holiday with this useful travel packing list. Understanding your destination and what you’ll need there will guide you to pack in only the travel essentials. And remember to leave some extra space for all the exciting gifts you’ll be bringing back! Remember, taking out travel insurance is always a good idea, to cover you for any eventualities. Let us know if you have anything to add to our travel packing list! 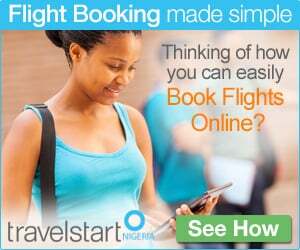 Sign up for our newsletter for more travel tips, guides, and amazing flight specials to your favourite destinations. This entry was posted in Industry Insight, Inspiration, Shopping, Travel and tagged luggage tips, packing, Travel Guide, travel tips. Bookmark the permalink.